All five seasons of the sci-fi television drama, co-created by J.J. Abrams, following a team investigating cases of strange phenomena that exist on the fringes of science. FBI agent Olivia Dunham (Anna Torv) suspects a sinister presence behind bizarre and unexplained events and enlists the help of a scientist who has been in a mental institution for the last 17 years, Walter Bishop (John Noble), along with his son, Peter (Joshua Jackson). Together, they explore various cases which go beyond the realms of normal police work and soon begin to uncover a trail leading to a global corporation called Massive Dynamic. More details of Fringe - The Complete Series Collection on wikipedia. 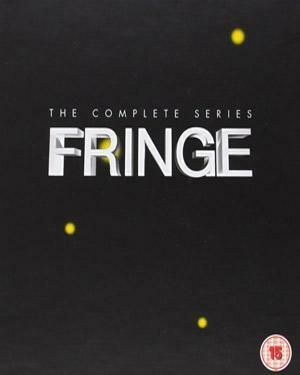 Original Fringe - The Complete Series Collection Blu-ray released by WARNER Bros comes in 20 disk Blu-ray pack. Blu-ray having 3 Subtitle. Duration of the Movie in Blu-ray is 3943 Min [approx.] While processing the order, we bubble wrap the Blu-ray in its original packing and send it in sealed plastic or carton pack. We don't offer download of the Movie Fringe - The Complete Series Collection, nor we send free poster of the Movie along with its Blu-ray order. We also don't offer free wallpaper or song download of the Movie. Poster and other accessories of the Movie can be purchased separately. Buy English Blu-ray Fringe - The Complete Series Collection and watch them at the comfort Of your own home. Online shopping Fringe - The Complete Series Collection Blu-ray, Buy Fringe - The Complete Series Collection Blu-ray, purchase original English Blu-ray of Fringe - The Complete Series Collection. Online store to buy Fringe - The Complete Series Collection Blu-ray	, online Blu-ray store india, buy English Blu-ray, watch English movie Fringe - The Complete Series Collection videos online. We don't offer Blu-ray renting for English movies online, Buy Original Fringe - The Complete Series Collection Blu-ray @ discounted and cheapest price online in India.